As far as I’m concerned, soup rocks! 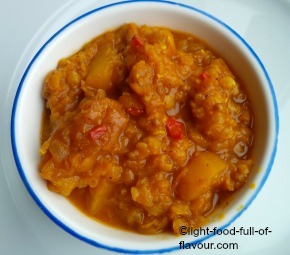 It’s easy to make soup that is massively tasty and filling yet low in calories and healthy. 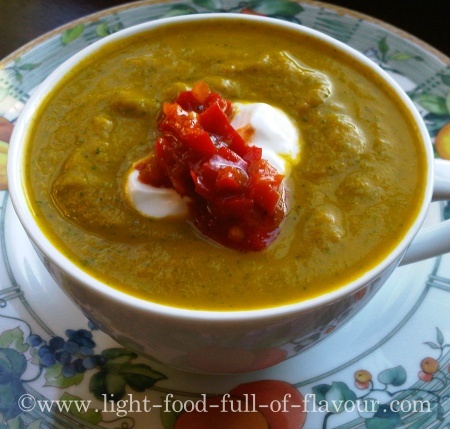 I want to inspire you with my flavoursome soup recipes. Make a big pot while you’re at it and freeze the rest in containers to give you easy, tasty food to re-heat when you are short on time and mighty hungry. I often make soup out of whatever vegetables I have at hand. You can make a really delicious soup with just a few ingredients. 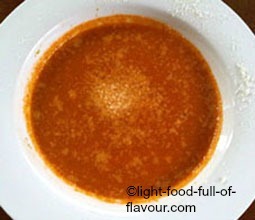 Don't miss my Oven-Roasted Tomato Soup which you make from my tomato sauce. It is a very tasty soup. 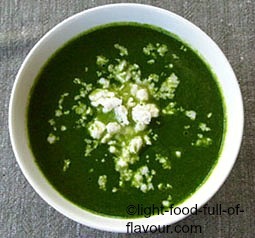 A vibrantly green and properly peppery watercress and spinach soup that is also a nutritional goldmine. 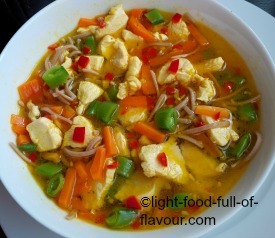 A warming and spicy chicken and noodle soup with ginger, garlic and chilli which is filling yet light. 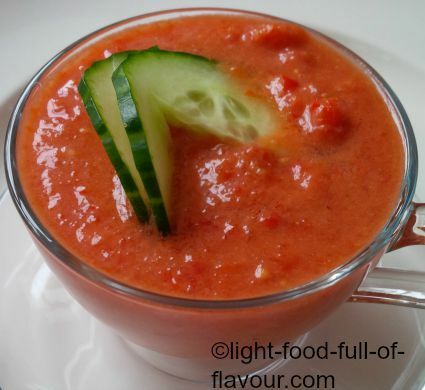 A family recipe for a traditional Spanish gazpacho - full of flavour and healthy! 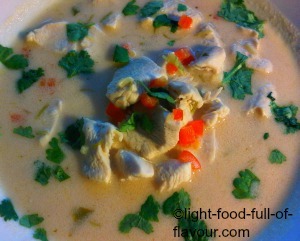 Here's a soup with Va-Va-Voom - a low-fat French fish soup bursting with flavour. 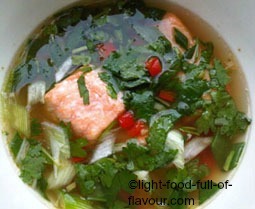 Fresh and fragrant Asian flavours are the stars in this stunning and light, hot and sour salmon soup. Packed with healthy ingredients and bursting with flavour, this spicy sweet potato soup is low in calories and has the ability to keep you full for longer. 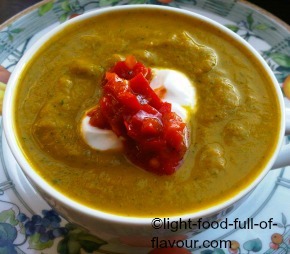 A wonderfully smooth, subtly spiced and filling lentil and carrot soup to warm you up on a cold day. Pea soup is easy to make and massively tasty. 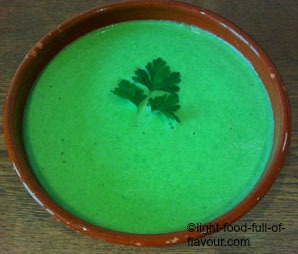 For a soup with an added kick, add fresh coriander (cilantro) and ginger. A really delicious, fresh-tasting soup that does not take long to make. 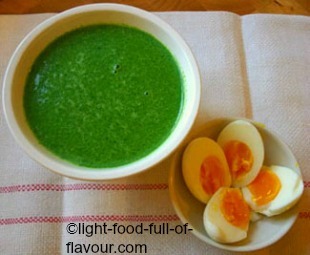 Super delicious comfort food - spinach soup served with egg halves. 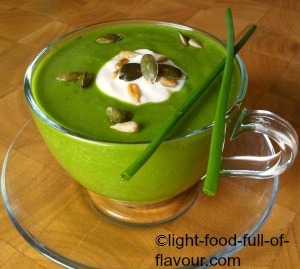 A fantastically tasty and super-healthy cold avocado and spinach soup. 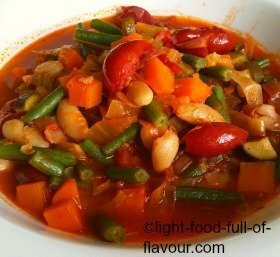 A healthy, hearty and super-tasty minestrone soup with cannellini beans and Parmesan cheese. 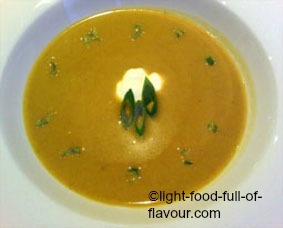 A fiery and super-delicious carrot and watercress soup which is also low in calories and healthy. 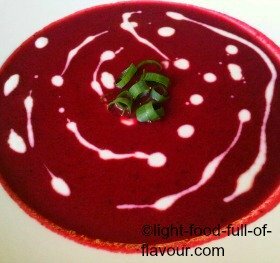 This is a mega-delicious Asian-style beetroot soup with chillies, lemongrass and lime. 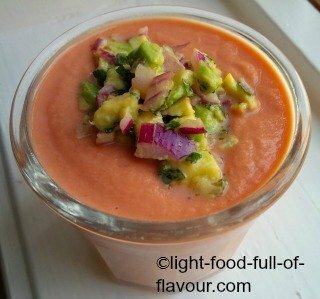 Perfect to serve on a warm summer's day - a chilled chickpea and tomato gazpacho with an avocado and mint salsa. 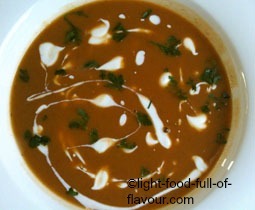 A soup to warm your heart - ginger chilli lentil soup which is choc-full of flavour but good news for your waistline.